"I really like the red leather seats!" It was my cousin Steve, admiring the interior of the test 340i BMW had loaned me for the week of Thanksgiving. Steve and his wife Karen are both lawyers, recently retired from the fast lane of the DC Beltway. Neither of these plug-in Prius owners had ridden in a BMW before. And no, they didn't practice poverty law. When I mentioned that the pebbled red leather interior would set them back an extra $1,450, Karen instantly piped up, "Oh we'd never spend for that." Steve didn't seem so sure. But I know one thing for certain. I would definitely pop for the "Coral Red Dakota Leather." Why? Because it looks fabulous and feels better. In fact the almost all new 3 Series BMW is such an exceptional bargain at a base price of $45,800, that the test car's $12,025 worth of "Options and Additional Charges" seem like the resort fees they tack onto your hotel bill at the Ritz. 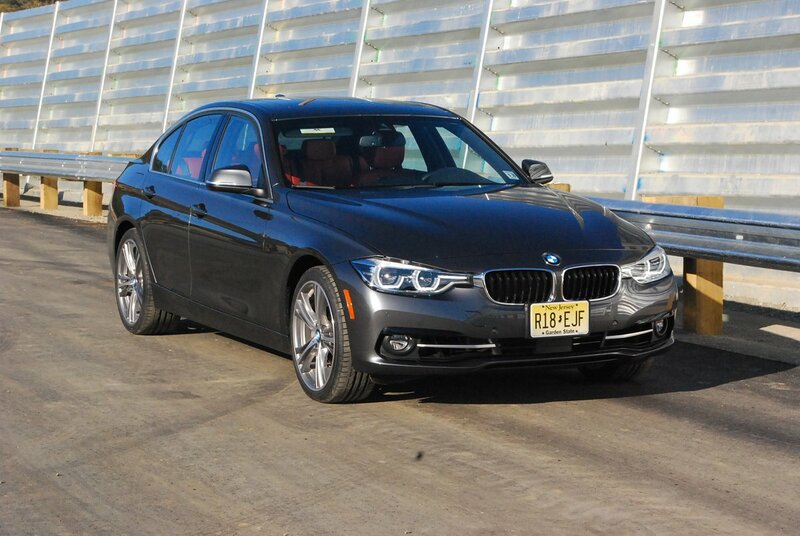 Compared to that wild interior, the 340i's Mineral Grey Metallic exterior ($550), demurely highlighted by Matte Chrome Exterior Trim (included), looks more conservative than a grey flannel suit from Brooks Brothers. Thus, potential miscreants can rest assured that - from the outside, at least - this $58,820 German smart bomb will not attract undue attention. But from the inside, its creamy, all new B58 engine will be stoking your lust like no 3 Series sedan in history. This 320hp engine lights off so quick that maximum torque of 330lb.-ft. is achieved at just 1,380rpm. In other words, maximum acceleration is available just off idle. And that's only the beginning of the fun house trajectory. As the pie sized tachometer's needle sweeps to the horsepower peak of 5,500rpm, the twin tailpipes emit a banshee shriek delightfully out of keeping with this sedan's buttoned down exterior appearance. The sedan's four doors and limousine-like rear seat don't exactly whet your appetite for brisk motoring. The complete absence of any "M" accoutrements deepens suspicion that this 340i is perhaps too housebroken for its own good. All doubts evaporated the instant we laid into the throttle and experienced the unadulterated adrenaline rush of a car capable of turning 0-60mph in 4.6 seconds. Wow! BMW claims that "The new BMW 3 Series Sedan has been redesigned to serve your individual sport driving style, with many elements of the previous Sport package now standard." Indeed, the basic 340i is now so fully developed you don't need to embellish it with the "M" package. On several stretches of heaving, twisty levee road bordering the Sacramento River, we enjoyed a traffic free opportunity to sample the exceptional stick of the 2016 340i. Although it would be difficult to attribute the 3's new-found stability and adhesion to any one particular improvement, the net result of optimized front suspension towers, upgraded rear damper technology, and additional suspension anchor points all play a role in making this latest 3 the best compact sports sedan BMW has built to date. The unyielding stick of its Bridgestone Potenza S001 contact patches (225/40R19 front, 255/30R19 rear) was a high point of my week in this car. This premium tire, which Mazda has notably selected as delivery rubber for its new MX-5 Miata, is a rare OEM find. In this application, it comes mounted on optional ($900) Sport Performance alloy rims which do a stellar job of showing off the BMW emblazoned brake calipers of the lightweight, four-wheel ventilated disc brakes. The strengthened chassis mounting points for the new 340i pay off in less body roll, flatter cornering posture, and a very high level of stick no matter which setting you've chosen on Driving Dynamics Control. You can choose the following DDC settings: EcoPro, Comfort, Sport and Sport+. Due to subsidence, levee roads are notoriously lumpy, with high crowns and treacherous shoulder fall-off. Yet even with the suspension calibrated to SPORT+, the revamped dynamic chassis never once bottomed out or flew into the air, no matter how injudiciously we punched the throttle or sawed at the wheel. This sort of benign composure in the face of daunting terrain marks the 340i as a consummate achievement in the fine art of suspension tuning. When BMW claims that "40 years later" the 3 Series is "still the benchmark of the segment it invented," take it to heart not hype.